Litepanels Gemini on location with production manager Mauricio van Hasselt at Aaron Sims Creative. Aaron Sims Creative, a full-service creative boutique for cinematic visual effects based in Los Angeles, has adopted Litepanels’ all-new Gemini 2x1 LED soft panel with precision color control and a broad array of dynamic lighting and cinematic effects for versatility in creating unique lighting setups. 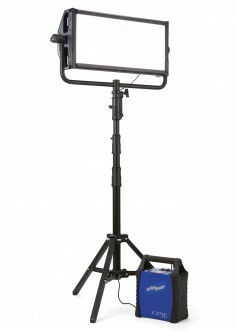 Litepanels Gemini 2x1 LED panel. “Lighting plays a critical role in our work, enabling us to add real-world components to our computer-generated visual effects for enhanced realism. We need highly versatile lighting tools that are not only dependable but offer fine-tuned control,” said Mauricio van Hasselt, production manager, Aaron Sims Creative. Litepanels Gemini delivers precision color control and a broad array of dynamic lighting and cinematic effects in a highly portable and lightweight LED panel, giving the ASC team newfound flexibility and versatility in creating unique lighting applications. The luminaire ideal high-speed photography with delivers flicker-free light for any frame rate, shutter angle, or intensity, with smooth dimming from 100 percent to 0.1 percent for the smallest glint of light. The ASC crew is able to set Gemini’s correlated color temperature (CCT) anywhere from 2,700 to 6,000K to get accurate color rendition and add or subtract green with the turn of a dial. The crew can select virtually any color in the different color modes from the 360-degree color wheel in HSI Mode or create specialty colors in RGBW Mode by controlling red, green, blue, and white independently. Plus, with its new firmware release, Gemini now offers a broad array of dynamic special effects ranging from emergency lights, lightning, and fire, to pulsing, square, and strobe, just to name a few. In one on-location example, the ASC crew can use Gemini to generate on-set muzzle flashes that the actors and environment can react to, making the scene much more realistic than if the effect were added later in postproduction. In another example, a scene with a laser beam, the crew was able to use Gemini to change the color of the laser instantly to support the director’s creative vision as he tried different scenarios for the scene. ASC also uses Gemini to generate interactive lighting on location that will later be motivated by sources created in CG.